Notes: The Northern & Eastern Railway was part of an 1836 scheme for a railway from Islington just north of central London to York via Cambridge, Peterborough and Lincoln. An Act of 1839/40 abandoned the section north of Bishop's Stortford and introduced a deviation from Tottenham to Stratford. The service began on the 15 September 1840 between Stratford & Broxbourne. The first intermediate station north of Stratford was at Lea Bridge Road (also known as Lea Bridge Walthamstow); the station opened with the line. It had two low facing platforms on the north side of Lea Bridge Road; this was a common feature of early railways. The line was initially laid to a gauge of 5ft 0in but already this had been identified as non-standard, and between 5 September and 7 October 1844 the whole network was re-laid to 4ft 8½in standard gauge. The single-storey main building, reached from the overbridge, was placed above the tracks; it is one of the earliest known examples of an ‘overtrack’ station building. It was brick-built with stone quoins, a handsome structure of classical character. There was a central pediment which, like the cornices on either side, was dentillated. Beneath the pediment, the centrally-placed entrance was given a round-headed arch with a shell inlay; the window openings on either side were also round-headed. The waiting rooms were, contained in the arches below the building. The building was designed by Sancton Wood and featured a bell turret on the roof with a bell that was rung when a train was due. Covered stairways led down to the platforms. The platforms were raised to standard height in March 1881. As the line was at an oblique angle to Lea Bridge Road the two brick waiting open fronted shelters were slightly staggered; they were fitted with plain canopies supported on eleven narrow cast iron columns. A house was provided for the stationmaster immediately west of the station on Lea Bridge Road. Lea Bridge station was supplied with gas in 1868 and presumably gas lighting was installed at that time. In January 1871 a slip siding was installed at Stratford end of Lea Bridge. This was provided with a signalman's hut for the purpose of signalling when goods trains were in the siding and clear of the main line. Presumably this was hand signalling. In February 1871 the Lea Bridge signalling contract was awarded to Messrs Stevens. It is not clear if this was for new or additional signaling, but probably additional as records contain countless mentions of track alterations and additions around this time. In March 1880 another signalling contract was awarded, this time to Messrs Saxby & Farmer. It is unclear exactly when Lea Bridge signal box was opened but it is shown for the first time on the OS Town Plan surveyed in 1893 so it was probably built by Saxby & Farmer c1880. It was at the north end of the up platform at what was known as Lea Bridge Junction. From Stratford, the line ran up the Lea Valley, but the settlements were on high ground to the west and many of the stations were inconveniently sited. Tottenham was the only one of any importance along the line and, until access to Maiden Lane became possible, it was used to unload cattle destined for the London market. To reach some more of these settlements a single-line branch, authorized in 1846, was opened on 1 March 1849 from Angel Road through Lower Edmonton to Enfield. Lea Bridge Road station was shortened to Lea Bridge in April 1871. By the middle of the nineteenth century Walthamstow had developed into a town of some 5,000 inhabitants and was a popular retreat for London businessmen who had to travel by horse-drawn bus to Lea Bridge Station to catch a train into the city. On 26 April 1870 a single line opened from Lea Bridge to Shern Hall Street (Walthamstow), worked by a shuttle service. This line and an extension to Chingford were sanctioned by an Act of 20 June 1870. The Chingford extension was opened on 17 November 1873, when Shern Hall Street was replaced by Wood Street. The branch was doubled by 2 September 1878 and opened to the present, larger terminus a mile to the north. The station has four platforms and is laid out for an extension that was never built. The Northern & Eastern Railway survived as a private company until being merged into the Great Eastern Railway in 1902. 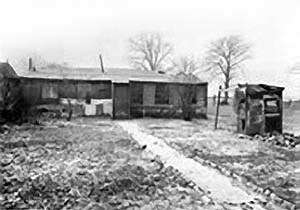 A bungalow ‘shanty town’ (left) grew up in the 1870s around Lea Bridge station, at fringes of the expanding urban area of Leyton. The settlement consisted of perhaps 69 wooden houses or shacks with wells and earth closets. There was a wooden mission church. Residents reared livestock and undertook market gardening. The shanty town was demolished in the 1920s with the area north of the Lea Bridge Road used to create a speedway stadium. From 1 August 1872 through trains ran from Shern Hall Street to Bishopsgate via Hackney Downs, crossing the Lea Valley line just north of Lea Bridge station. A new Stratford - Walthamstow service using the Lea Bridge spur was introduced on 7 June 1880 with some trains running through to Chingford. With the introduction of electric trams this service was withdrawn on 3 October 1914. This was not the end of passenger working over the Lea Bridge—St James’s Street spur, as from 1914 there were summer services between North Woolwich and Chingford and between Lea Bridge and Chingford. A GER a telegraph works on the east side of the station proposed in 1897. In October of that year the contract was awarded to A N Bateman and the cost was £5,612 17s 0d. This was a considerable sum of money in those days, thus indicating the size and comprehensiveness of the works. It was originally powered by gas engines and these were replaced by electric motors in June 1909. It is believed that a ‘dummy’ signal box was constructed at the works. If this was built it would have been for testing of telegraph equipment in conjunction with mechanical signalling. Such testing could have been done inside the workshops so the existence of a ‘dummy’ box should be treated with caution. The works was located at the end of the siding parallel with Lea Bridge Road. In December1908 a long trailing siding from Lea Bridge Junction was opened to the Walthamstow Urban District Council Sewage Works in Forster Road to the north of the station. 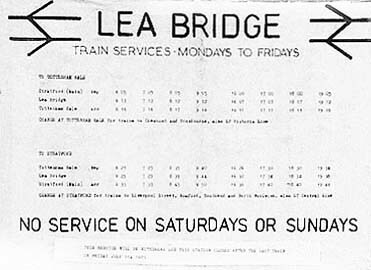 In the 1920s Lea Bridge was served by two services, Liverpool Street - Hertford with 18 up trains and 16 down trains on Monday-to-Saturday with five trains in each direction on Sunday and Palace Gates - North Woolwich with 16 trains a day in each direction on weekdays but no weekend service. At that time there were Sunday services via the Hall Farm Curve to the Chingford branch. A similar frequency was still in operation on both routes in 1950, slightly reduced on the Hertford service and slightly increased on the North Woolwich service. Through the twentieth century rail-served industry was established to the east of the line; this included a cast stone works which was served by four sidings and, on the same site, the H Young & Co Lea Bridge Steel Fabrication Works which was established at Lea Bridge in 1943 after their Nine Elms works was destroyed in a German air raid. The company relocated to Norfolk in 1995. In 1923 the GER became part of the London & North Eastern Railway (LNER). On 14 July 1928 a speedway stadium was opened next to Lea Bridge Station and some special services were introduced to bring speedway enthusiasts to the station between 1928 and 1939 when the stadium closed. The telegraph works was demolished in 1939 but there seems to be no record of when it actually closed; presumably it was after the formation of the LNER in 1923. Following demolition a new goods depot was built on the site. This was connected to the station street level building by a high level walkway. On 31 March 1944 the station building was gutted by fire, although the frontage survived; the building was repaired c1950. At some stage during the LNER era the company’s distinctive ‘mint imperial’ style electric lighting was installed, presumably accompanied by small nameplates. After World War II, in 1948 the railways of the UK were nationalised, and operation of the station passed to British Railways Eastern Region. In the BR Modernization Plan of 1955 the Chingford branch was listed for electrification. Work began early in the following year to prepare for operation from 6.25kv overhead lines but the but the scheme was severely cut back for financial reasons. Whilst electric trains did reach Chingford in 1960, one victim of the cut backs was the Hall Farm Junction - Stratford section. The only part of this route to be electrified was the Hall Farm Curve. The wires stopped abruptly just short of Lea Bridge and thus were never used.. The signal box at Lea Bridge, together with others in the immediate vicinity, closed on the night of 28/29 June 1958. This coincided with the opening of the new boxes at Temple Mills. Three-car multiple-unit sets made up the trains, which ran from 14 November 1960, but there were many technical troubles, so that steam-hauled passenger working did not entirely cease until the end of 1961. Although the Hall Farm Curve to the Chingford line had been equipped for electric working it was rarely used and the rails were lifted in 1967. The station was fitted with British Railways Eastern Region blue signage in the 1950s, photographic evidence shows as early as 1952. Totem signs, which were fitted to electric lamp posts were of the half-flanged and later fully-flanged variety. These had all been removed by the late 1970s and replaced with BR Corporate Identity signage, but the blue running-in boards survived until 1984. 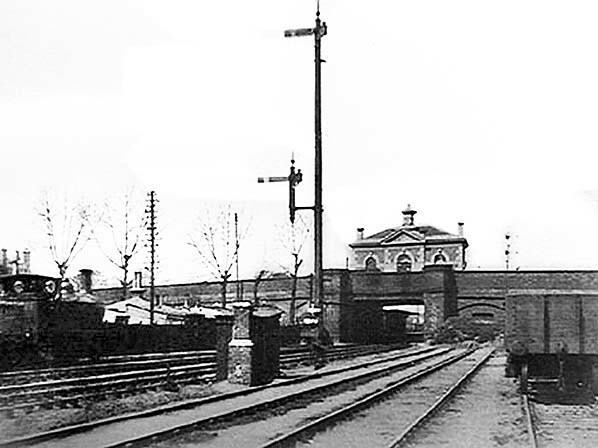 Freight services were withdrawn from Lea Bridge on 7 December 1970 but the goods depot was retained as a parcels depot at least until the mid-1970s The station became an unstaffed halt in 1976. By this time, the only trains serving the station were those operating between Tottenham Hale and North Woolwich via Stratford (low level platforms). In 1984 British Rail announced its proposal to withdraw the direct passenger service between Tottenham Hale and Stratford and with it close Lea Bridge Station. The proposed date for closure was 1 October 1984 but following objections this was deferred until 8 July 1985. It is understood that at the time when BR was actively pursuing the closure of the station it was left locked for more than a week (perhaps to see if anyone noticed!). Prior to its closure the station had been neglected for some years and none of the original station buildings remained having been replaced by open shelters on each platform; even these were removed before closure. The original building on Lea Bridge Road had also been replaced with a smaller modern structure. Prior to closure, the hourly rush hour service was the best service the station had for many years but it was used by very few people. On the last day, a local acoustic punk-folk band Aunt Fortescue's Bluesrockers played a gig at the station and on the final train. They had previously played 'on train' gigs to highlight the station’s plight and bad service and forthcoming closure. 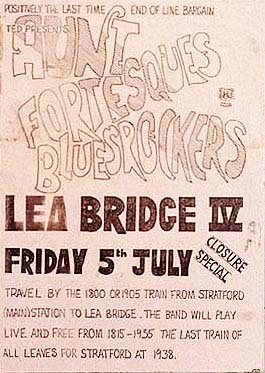 On the occasion of the band’s concert in March 1985 the station staff at Stratford were bemused when numerous passengers appeared at the booking office in the early evening requesting return tickets to Lea Bridge. The last train was formed of a two-car Cravens Class 105 DMU. The two-car set had been painted in a non-standard livery for an open day at Stratford depot. Stratford often applied its own version of the BR livery, especially on locomotives. The car numbers of the DMU were 54122 and 53359, originally E56122 and E50359 respectively. Although usually referred to as a Cravens Class 105, the power car, 53359, was actually a Class 106. The difference was Class 105 had AEC engines and Class 106 Leyland engines. The last train, driven by driver Dave Newell, left Lea Bridge in the middle of a violent thunderstorm. At this time the sidings serving the parcels depot was still in place but very rusty and clearly out of use for many years. The line through Lea Bridge was electrified in 1989. Initially the main service was Cambridge - Stratford but this was soon cut back to Bishop's Stortford - Stratford on weekdays. It is for this reason the present service from Cambridge departs Cambridge at the odd intervals of 04 and 21 minutes past the hour off peak to Liverpool Street but at regular off peak intervals of 28 and 58 minutes past the hour in the down direction. The Cambridge - Stratford service continued to operate Sundays-only but this was diverted to Liverpool Street via Hackney Downs following the takeover of the inner suburban services by London Overground. Since closure of the station there have been numerous proposals to reopen it, and in 2002 Waltham Forest Council commissioned a feasibility study for a scheme to reinstate the Hall Farm Curve and reopen Lea Bridge station. The work was funded by a £50,000 grant from Transport for London. The studies showed that the scheme was relatively straightforward in engineering terms and that there were no major technical problems. The scheme would involve laying approximately 800 metres of track on the existing embankment, which is still in good condition. Services could then be run from Chingford in the north of Waltham Forest, via the Hall Farm Curve to a reopened station at Lea Bridge, then Stratford and possibly beyond providing the population of Waltham Forest with an efficient rail connection to the 2012 Olympic site and Lower Lea Valley area. In December 2005 a new service between Stratford and Stansted Airport reintroduced direct passenger trains between Stratford and Tottenham Hale passing through the closed Lea Bridge station. The campaign to reopen the station continued as part of a general regeneration of the area before the 2012 Olympics. For many years, plans had been under consideration to rebuild and reopen the station and the nearby Hall Farm Curve junction, as part of wider plans for the redevelopment of the Stratford and Lower Lea Valley area. In January 2013 it was announced that plans had been approved to rebuild and reopen the station. Construction of the £6.5m scheme was planned to start in spring 2014. The station was included in Network Rail's Route Specification for Anglia in 2014 for opening within the next five years. In October 2013 the overgrown platforms were cleared in preparation for construction of the new station building. The new buildings were to be situated on the up side (towards Stratford) rather than on the road bridge over the line, and the platforms were to be linked by a footbridge. Estimates by Transport for London show 352,000 users annually by 2031 with a service of two trains per hour. It was hoped that—after 29 years of closure—the station would reopen in late 2014. Following objections raised by three freight operators who also use the line the construction date slipped, but work started in July 2015; the station opened in spring 2016, with the first trains arriving just after 8.20pm on Sunday 15 May. Construction costs had nearly doubled to over £11m. Waltham Forest Council has provided £5m, with £1·1m from the Department for Transport’s New Stations Fund and £5·5m from developer contributions managed by the Stratford Transport Implementation Group. The new station was designed and constructed by Volker FitzPatrick in partnership with Network Rail. It has two resurfaced platforms, a new footbridge and lifts, station canopy, ticket vending machines, Oyster readers, waiting shelters, help points and cycle storage, but no car park. It is hoped that the new station will open Leyton up for growth, giving the area better and faster links with some of London’s crucial transport hubs, and making it a more attractive prospect for developers, businesses and residents. The official opening ceremony took place the following day with a VIP party arriving by train from Tottenham Hale at 10.01. Children from nearby Sybourn Primary School greeted Council Leader Chris Robbins and Rail Minister Claire Perry MP, as they arrived at the station. Speeches were made by Jamie Burles, Managing Director of Abellio Greater Anglia who are providing the new service; Councillor Chris Robbins, leader of Waltham Forest Council; Richard Schofield, Network Rail Route Managing Director, Anglia; Stella Creasy, Labour MP for Walthamstow; and Claire Perry, Parliamentary Under Secretary of State at the Department for Transport. Another invited guest at the ceremony was Dave Newell who was the driver of the last train into Lea Bridge in 1985. Dave is still driving trains and is now one of Chiltern Railways’ most respected drivers. Also there to entertain the invited guests and onlookers were Aunt Fortescue's Bluesrockers, who having played on the station on the last day in 1985, reformed specially for the reopening 31 years later. Lead singer Graham Larkbey (a doughty campaigner for improved railway services in London and prolific photographer of railway stations) was also aboard the first train to entertain the passengers the previous day. The service is provided by Abellio Greater Anglia with two trains an hour in each direction. All trains start at Stratford. On Monday-to-Saturday there are two trains per hour to Bishops Stortford, with some services in the weekday rush hour and start / end of day running to (or from) Hertford East and Broxbourne. On Sunday there are two trains per hour to Hertford East. Tickets from Michael Stewart & Brian Halford (8473, 4336 & 0056). Totem from Richard Furness. Route map drawn by Alan Young. Thanks to Lucy Harrison, Darren Kitson & Graham Larkbey. Regional History of Railways of Great Britain - Vol. 3 Greater London by HP White - David and Charles 1971 ISBN 0 7153 5337 3 . Looking north-west towards Lea Bridge station c1897. The main building on the bridge is straddling the tracks, a feature more commonly associated with the North Eastern Railway in the last quarter of the nineteenth century. Note the unusually tall signal. There was only one reason for signals being mounted on posts that tall - sighting from a distance when drivers' view was obstructed. This particular signal applied to trains approaching from the Stratford direction - i.e. from behind the camera - but quite what would have obstructed drivers' view to warrant such a tall post is not known. The locomotive on the left is too indistinct to make out any details other than that it is a small tank locomotive with semi-open cab. The sidings on the right served the Lea Bridge Gasworks. 1870 1:2,500 OS Map. Although the station was still known as Lea Bridge Road at this time, Ordnance Survey has used the name 'Leabridge', a form that was never used; it is not unusual for Ordnance Survey to substitute its own spelling. A residential estate has built up to the south-west of the station but in other directions it is surrounded by open countryside. Note the stagger in the platform buildings matching the angle of the road in relation to the track. At this time the station had no goods facilities and no sidings. The Lea Bridge Gas Works, which opened in 1853, is seen to the south of the road bridge on the east side. 1893 1:1056 OS Town Plan. The station has now been provided with a single siding and a loop on the up side and the station now handles basic goods traffic. Access to the siding is controlled by a new signal box at Lea Bridge Junction. To the south of the road the gas works has expanded; it is still incorrectly shown as Leabridge Gas Works, but the station name has been corrected and is now Lea Bridge. 1913 1:2,500 OS Map. A building is now shown adjacent to the siding. 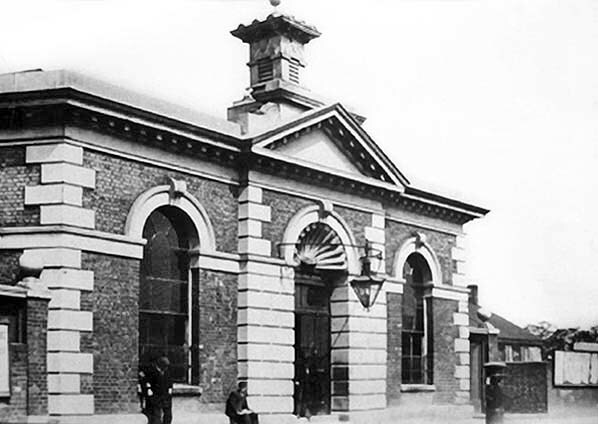 This is the GER's telegraph works which opened in 1898. The smaller building to the south-west may be the 'dummy' signal box which is said to have been built on the site. North-west of the station on the up side a trailing siding runs north to serve the Walthamstow Urban District Council Sewage Works in Forster Road. To the south of the station some of the timber housing in Lea Bridge Gardens has been demolished to make way for a public park, also known as Lea Bridge Gardens. There has been some residential development to the east of the railway. 1939 1:2,500 OS Map. New industries have developed to the north of the station, in particular a cast stone works with the south of the station Lea Bridge Gardens has been cleared away to make way for Lea Bridge Stadium four sidings going into the works. To. The stadium was originally a speedway venue, but also started hosting football matches in 1930 when Clapton Orient moved to the site. There has been substantial residential development to the north-east of the station. Click here for a larger version. 1955 1:2,500 OS Map. Lea Bridge Stadium was short lived and closed at the end of the 1938 season and by 1955 had been largely demolished with the exception of the main stand (out of view to the left). Substantial new industries have developed to the north of the station but most are not rail-connected. The cast stone works is now shown as an engineering works with some expansion of the buildings. Power & Dean Ransomes Ltd. (Part of H Young & Co) took over the site in 1943 after their steel fabrication works at Nine Elms was destroyed in a German air raid. The old GER telegraph works was demolished in 1939 and a large goods depot built on an extended site. This is connected to the street-level station building by a high-level staff walkway (FB). Click here for a larger version. 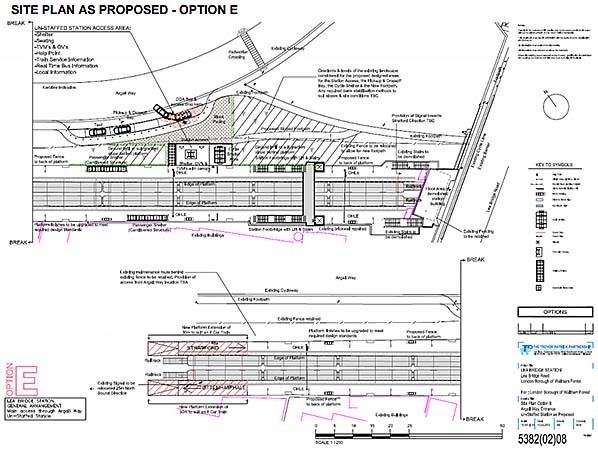 Five options for reopening the station were proposed with a 6th for later upgrading to a staffed station. Option E, the council's preferred option is shown here. This option was eventually adopted. The attractive clasical street level building is seen in the first decade of the 20th century. The brick and stone building was designed by Sancton Wood and featured a bell turret on the roof with a bell that was rung when a train was due. 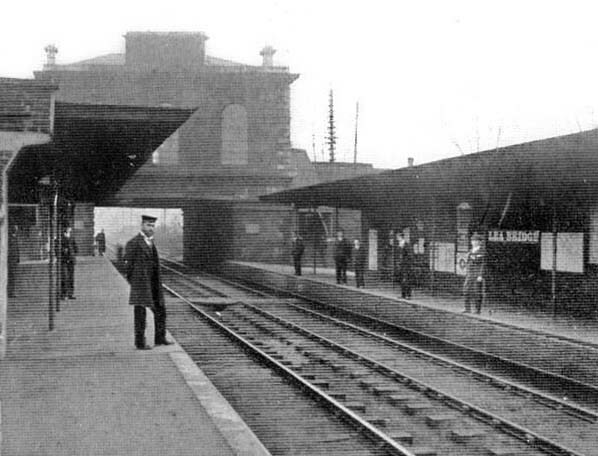 Lea Bridge Station looking south-east from the up platform c1907. The platform buildings comprised open-fronted brick shelters with plain canopies supported on 11 thin cast iron columns.